Goshen, NY – On May 30th seniors celebrated the 25th anniversary of National Senior Health & Fitness Day, the largest annual health and wellness event for older adults. 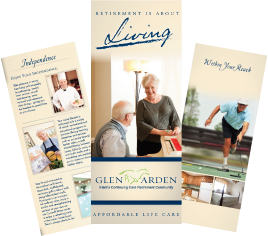 Residents of Glen Arden, at 214 Harriman Drive in Goshen, NY, were some of the 100,000 senior Americans who exercised during the recognized event. Sulekha Zaug led residents of Glen Arden in several exercised-based events during National Senior Health & Fitness Day. This year’s theme was “Active Today – Healthier Tomorrow”, which was exemplified by the events of the day. These events ranged from full-body exercising to an educational course on making correct dietary choices in your life. Sulekha Zaug, Director of Recreation, held events for a room full of seniors that included full-body exercise class, Poker Chip Walk, and a Tai Chi / Yoga Class. From there seniors joined Derek Somerville for a Balance and Fall Prevention Class. Tying into the “Healthier Tomorrow” the group joined Nancy Tolosky-Heine and Joann Pulsford as they hosted a Nutrition and Hydration Presentation, teaching the importance of hydration and healthy food choices. The mayor of Goshen, Kyle Roddey, gave closing remarks for the event. Leading the group of seniors, Roddey gave an empowering speech on the importance of staying fit as you grow older. Prizes were handed out to those who participated during the day afterwards. This event is organized by public/private good health partnership by the Mature Market Resource Center (MMRC). National Senior Health & Fitness Day offers activities for older adults at more than 1,000 locations across the United States. These locations include hospitals, park and recreation departments, senior centers, health clubs, retirement communities, houses of worship, health departments, and other community locations.